Having an accident, a fender bender or just dents from hail and scratches and dents from other drivers is stressful enough without the worries about the restoration and cost associated with these repairs. The friendly, helpful and courteous staff at Hi-Tech Auto Body goes the extra mile. They work hard to keep the repair costs down and give you peace of mind with their welcoming attitude, friendly smile and concern. The staff at Hi-Tech Auto Body works with you and your insurance company to make the whole process smooth and stress-free. Hi-Tech Auto Body has been a family owned and operated business since 1995, conveniently located one and a half miles down Highway 42 in Osage Beach, Missouri. And their reputation has been built on top-quality repairs, customer service, convenience, and honesty. For over 10 years, Hi-Tech Towing has been providing Mid Missouri with 24-hour, 7 days a week quality tow service. Hi-Tech’s mission is to provide you, the customer, with ultimate satisfaction and affordable prices. We specialize in complete Road Side Assistance, junk car removal, tire change, jump start, lock outs and classic car transporting. Our drivers are trained professionals in loading and unloading your vehicle with care. Hi-Tech’s arsenal of tow vehicles consists of three monster tow rigs, 4 rollbacks and a wrecker. Hi-Tech Towing and Recovery has all the equipment needed to perform every duty at a recovery scene, no matter how big or small the job, Hi-Tech can handle it. 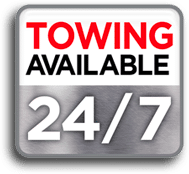 Our 24-hour towing services are available for pick-up and delivery of your vehicle. Whether you need a tire change or you have been in a collision and are unsure of what to do with your vehicle, we are always there to help. We are also contract towers for many roadside service companies including AAA. We have a 24-hour answering service to provide assistance at anytime, day or night. If you are in need of our towing services you may reach us by calling 573-348-4748.